Ms. McCann is from Astro City an extraordinary series by Kurt Busiek. 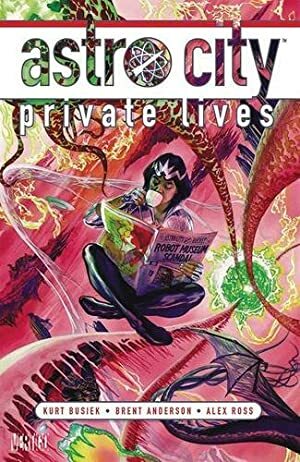 Astro City spins an entire comic book universe with a masterful use of archetypes and story beats. But almost everything is seen from a human interest and slice-of-life perspective, often by ordinary persons. The story with Raitha McCann was a great example of this. While the action is about a Doctor Strange analogue, the story actually follows the magician’s executive assistant. It thus offers an intriguing slice-of-life about working on the nuts-and-bolts of Earth’s defences against mystical threats, using Post-It™ notes and scheduling software. Group Affiliation: Employee of the Silver Adept. Base Of Operations: Astro City. Height: 5’5” Weight: 160 lbs. Raitha McCann is a smart, resourceful and well-organised executive assistant. She does most of her work on her iMac or her MacBookPro . She presumably cannot wield magic herself. But she knows a lot about mysticism, magical threats, dimensional topography, thaumaturgic tomes, mystical artefacts and entities, etc.. She can even speak and read a number of languages used in powerful grimoires. McCann also has connections. Most people dealing with the Silver Adept will go through her, from E.A.G.L.E. when they need a magic consultant to otherdimensional wizards. She’s just the assistant, but her Rolodex (well, her Mac’s Address Book) is very high-powered. And of course, her boss and friend the Silver Adept (Munduna Kim) is an extremely powerful magician. The Silver Adept has a telepathic link with Ms. McCann, which she whimsically calls the “aethernet”. They can thus easily communicate through time and space (hearing and seeing each other). But this doesn’t work when the Adept is in certain unusual mystical dimensions. As a hobby, Raitha does pottery. Some of her ceramics have received attention from the thriving arts and crafts community in Astro City. 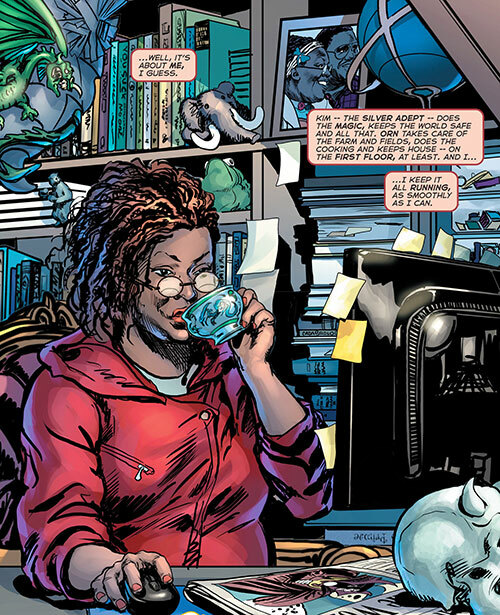 Raitha works at the Silver Adept’s home. This is a Victorian brownstone in Astro City’s South Hill neighbourhood – the Southern part of Government Hill. This large house is disguised by intricate illusions. As a result, everything within and without will look thoroughly mundane to visitors who have not been cleared. It also has major mystical defences. These include multiple magical guardians directed by Grev, the gargoyle above the front door. There are multiple intrusions attempts per day, though the occupants won’t notice the vast majority as the guardians swiftly do their job. Beyond the security guys and Raitha, the staff includes Orn. He’s a sort of minotaur in charge of growing and cooking food for Raitha and Kim. The back of the house is a portal to the Field of Allatar, a pleasant agrarian dimension where Orn keeps his apiary and fields. Of course, the house includes an exceptional library of magical tomes, and holds various artefacts. The brownstone also houses Stockton and Moreton. These are two strange little animals who seem to be the equivalent of puppies. They are the Silver Adept’s house pets. Raitha McCann is the executive assistant of the most powerful good-aligned magician on Earth and in nearby dimensions. This is the Silver Adept (Munduna Kim). The “Munduna” part is apparently a title like “Doctor” or “Miss”). The Silver Adept is the equivalent of the Sorcerer Supreme. She heroically prevented innumerable magical disasters. But she’s also a complete ditz. Therefore, Raitha’s clerical work and can-do competence are indispensable to ensure the mystical protection of the Contiguous Worlds. McCann has worked for the Adept for years. She is presumably Canadian, since they were originally based on Vancouver Island. Circa 2013, they moved to Astro City following a magical intuition of the Adept. After that, things have grown more hectic. Now Raitha’s job resembles that of a police dispatcher as well as that of an exec assistant. The schedule of the Silver Adept is crammed with important appointments, crises and urgent interventions. 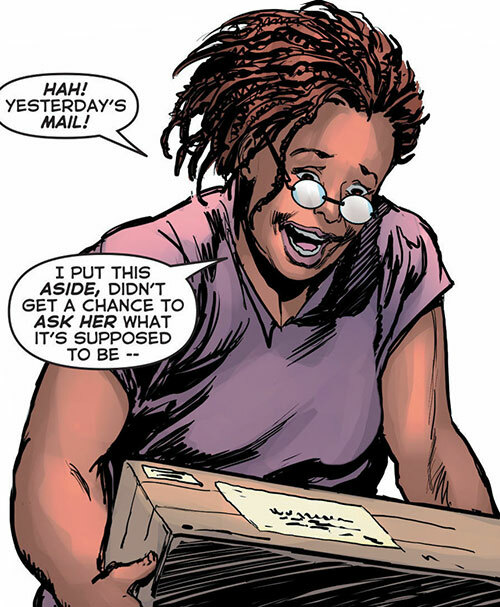 As a result, Raitha constantly has to juggle to keep it running while keeping Kim informed, answering the mail and phone, keeping the lists of magical artefacts current, etc. McCann appears to be in her late 20s. She’s usually wearing comfortable streetwear, a pair of reading glasses and a sideswept braided hairstyle with henna-dyed natural hair. Raitha is a pleasant, smart, competent professional. She’s good at coming up with solutions and keeping epic messes organised. She’s pragmatic and positive. Raitha is careful to manage her stress through meditation, crafting her ceramics, working outside in the nice weather of the dimension behind the house, enjoying social events after work, etc. Albeit Kim being an airhead makes Raitha’s work that much harder, she likes her boss. The Silver Adept a friendly young woman and a top-shelf heroine. And though the job is hard, it has plenty of perks, starting with the sense of accomplishment and Orn’s superb cooking. Expertise (Executive assistant work), Familiarity (Meditation), Headquarters (Extensive), Languages (several unspecified mystical languages). Silver Adept (Munduna Kim, High, Powerful), Mystical community (Low), Astro City arts and crafts community (Low). Source of Character: Kurt Busiek’s Astro City universe. Writeup completed on the 11th of May, 2014.